Qlik checks into Forbes annual list of top 100 global innovative growth companies and we use Qlik Sense to bring the list to life. 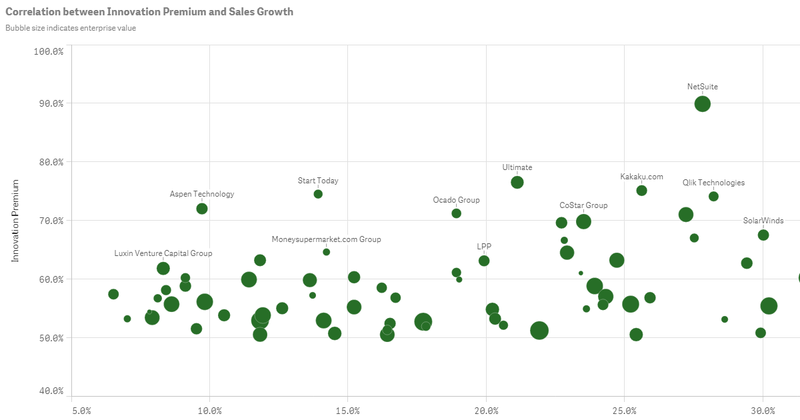 In what has become somewhat of a tradition here at Qlik, we figured the best way to celebrate being named to the Top 10 in Forbes’ Most Innovative Growth Companies Listwas to plug the results into Qlik Sense and see what we could learn. One thing we already knew was that 27 of our valued customers and partners were listed as well and we could not be happier for them – but we wanted to learn more. The data we pulled from the list included all of the metrics used to assess the companies: enterprise value, 5-year average net income growth, 5-year average sales growth, industry and of course, company names. The largest enterprise value by industry belongs, unsurprisingly, to Software and Services at $108.2 billion with a 5-year average sales growth of 26.6%. #Qlik was named a Top 10 Innovative Growth Company by @Forbes, but what can #QlikSense tell us about the list? Of that $108.2 billion, five of the top Software and Services vendors are in the Top 10 of the Growth Companies List. In addition, based on 5-year average sales growth, Qlik is actually in the Top 5 of Software and Services vendors. As for 5-year average sales growth among all 100 companies listed, Telecommunications Services and Consumer Services come out on top with marks of 53.2% and 51.5% respectively, as shown below. Additionally, as you can see from the scatterplot below – the majority of the 100 vendors on the list fall just under 60% on the Innovation Premium as determined by The Innovator’s DNA (you can learn more about them at http://innovatorsdna.com/assessment/learn-more/). It’s also clear that the majority of these vendors fall just under 20% in 5-year sales growth as well. These are just a few of the insights we pulled from analyzing the data using Qlik Sense – what else will you discover? Click through the interactive charts above and let me know what you find in the comments!